nurture the bonds of the community of Your people. hope, strength, trust and all that is good. is also for the pursuit of the truth and for the greater glory of You! May we always have You in forefront in all we do. Your beloved son and our LORD, in His name we ask and pray. We venerate Your Cross, O' Christ Jesus, and we praise and glorify Your Holy Resurrection, for You are our God, and we know no other than You: we call on Your name. Come, all you faithful from all the earth, let us venerate Christ's holy Resurrection, for behold, through the Cross joy has come into all the world. Let us ever bless the Lord, praising His Resurrection, for by enduring the Cross for us, He has destroyed death by death. Hallelujah! (of the knowledge of good and evil). that they may see [and believe]! All praise and glory are Yours. Amen. LORD, lead me in the way that I should go and guide me. Heavenly Father, by Your word of grace and Your Holy Spirit of truth, open my mind and heart into a deeper understanding and knowledge of our Lord and Saviour... Jesus Christ. Who is the light of the world and who illumines the path of all that trust in His saving power. and the lamp to my feet, who is the light to my path. 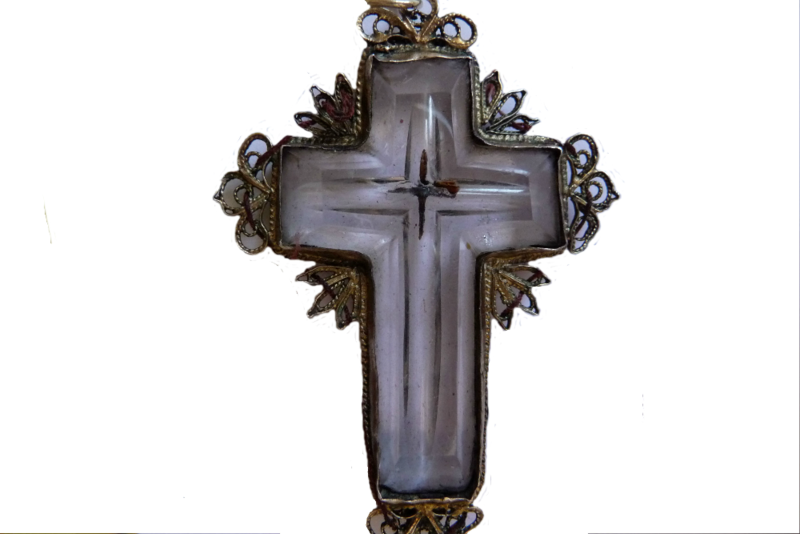 The True Cross Relic of our Savior Jesus Christ is the greatest and most precious of all relics. It is only to the True Cross, from among all other relics, that the Christian faithful are instructed to genuflect. Every other image and relic (whether of our Lord or of any of the saints) is venerated by a bow, but the relic of the True Cross is adored and worshiped with a 'Genuflection' and a kiss. † = place the sign of the cross upon yourself. and let those who hate Thee flee from Thy presence. 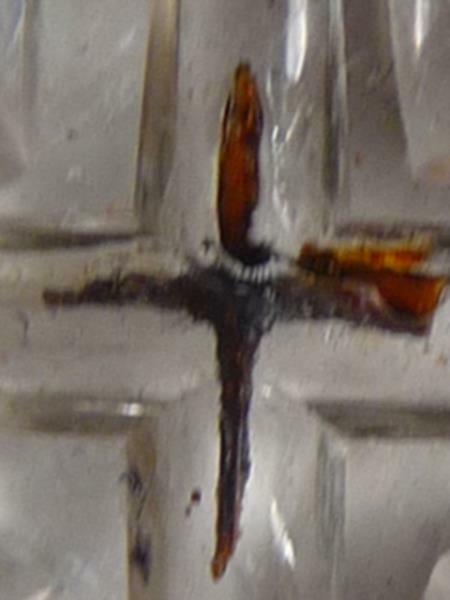 (above) a Super-magnified image of an splinter of the wood: from the Tree of Life: used as the cross of crucifixion of Jesus; ' the Miraculous True Cross Relic ' Save us, Saviour of the world, for by your Cross and Resurrection you have set us free. What I see in the image of the cross (above). For the LORD has truly opened my eyes! the LORD of Host, will open your eyes and bless you. that you might be filled with all the full-ness of God of Heaven. unto Him be glory in the church by Christ Jesus throughout all ages, world without end. Through the same Christ I pray. Peace be with you, now and forever. Amen. The Lord lift up His countenance upon you, and give you His peace. John is the message of Christ Jesus, to us-ward; God's creation. God’s desire is for His Word to be known and believed, with the result that people are transformed (Luke 6:46). To reject the light we’ve been given is to remain in darkness. To spurn the grace of God and reject the Savior is to receive the due penalty for our sin. Lord Jesus, inspire me to read your Scriptures and to meditate upon them day and night. I beg you to give me real understanding of what I need, that I in turn may put its precepts into practice. Worship Him who made the heavens, the earth, the sea and the springs of water (Revelation 14:6-7). Praise and Worship our Lord Jesus Christ and Him alone. Amen. 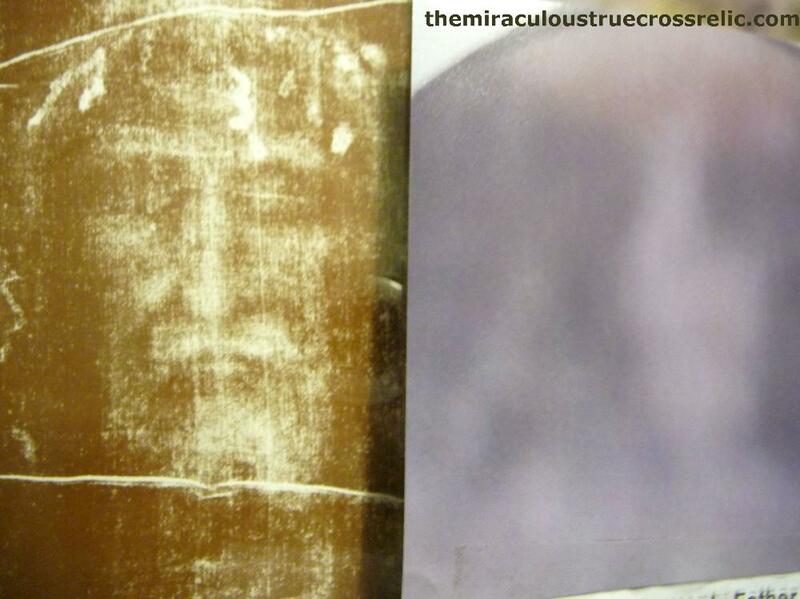 Image of Holy Shroud (L), Image Holy Face 'True Cross Relic' (R) - May the most holy, most sacred, most adorable, most incomprehensible, and ineffable Name of God be forever praised, blessed, adored, loved, and glorified, in heaven, on earth, and under the earth, by all the creatures of God, and by the Sacred Heart of Our Lord Jesus Christ in the most Holy Sacrament of the Altar. Amen. 1) Amendment of life – turn away from sin. 2) Make Acts of Reparation – pray and make small sacrifices daily for sinners. 3) Pray the Rosary – daily rosary with meditation on the rosary mysteries. 5) Devotion to the Immaculate Heart of Mary – consecration to Our Lady, and the practice of the First Five Saturdays devotion (going to Mass, Confession, and praying the rosary on five consecutive First Saturdays of the month) to make reparation to her Immaculate Heart.Our Lady made it clear at Fatima that the root of all the world’s problems is sin. Therefore her message at Fatima included themes of prayer, repentance, penance, sacrifice, and a turning away from sin. Read the Five Prayers Taught at Fatima by Mary and the Angel of Peace. As Mary stood at the foot of the cross of Her beloved Son giving Him courage with Her loving presence so She is near you in your needs, struggles, and sufferings. Our Lady’s role as a mother is to help us to live all things in relationship with God, reminding us that all will be well, it is never an event in itself, but the fact that God is at work that makes a circumstance turn out for the good. God Himself does not change or undo the nature of a struggle or of a difficulty. to our total life, working out His will in the circumstance. form us into loving people. and only hearts full of love will find in Him eternal happiness. We pray that love always triumphs in you. We can find in Our Lady of Fatima’s appeal a way of living out, in our daily lives, in love. She asked prayers and sacrifices for the conversion of sinners. making them holy and giving them supernatural value. They actually become an expression of love. the Immaculate heart of Mary”. May this encourage you to respond to our Lady's call. God bless you and your love ones. even more than images made after the proper proportions of his natural body – i.e. paintings, icons, and sculptures made after the physical likeness of Christ - the Cross is the image of our Savior. More even than the image of The Divine Mercy. The True Cross represents Christ as his perfect icon. saturated with the most precious and holy Blood of our Lord. was sanctified by contact with his Precious Body. in bringing about the salvation of the whole world. is the Greatest and Most Precious of all Relics! "Hail, O' Holy Cross and our only Hope"
for the wood of the cross has brought joy to the whole world." with all those in need of Your Mercy. Help me to love You more. be used to engulf the hearts of everyone I come into contact with. With the Love, which You infuse in my soul, help me to conquer all evil, convert souls and defeat the devil and all those wicked agents of his, who try to destroy the Truth of Your Holy Word. I ask this in your Holy Name Lord Jesus. Amen. out in piercing words that will echo until the consummation of the ages: “My God, My God, why hast Thou forsaken Me?” (Matt. 27:46). 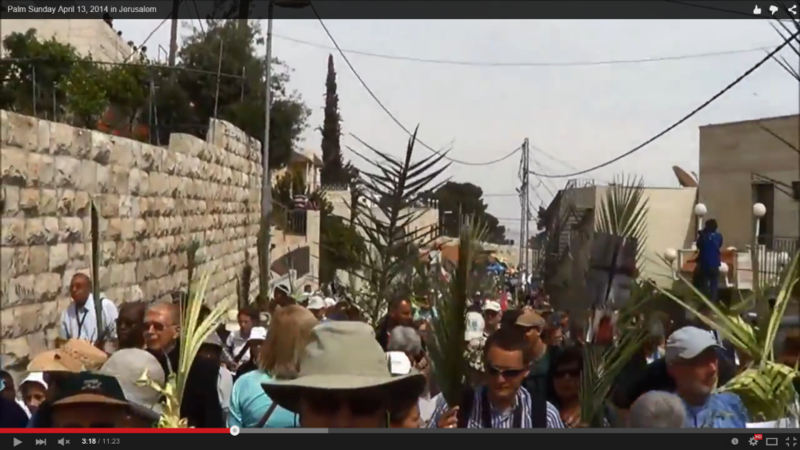 Via Dolorosa, we will shirk Providence’s designs for us. judge will render to me in that day” (2 Tim. 4:7-8). holy burden of purity and other virtues, unceasing attacks and mockeries of the Church’s enemies and betrayals of false friends. 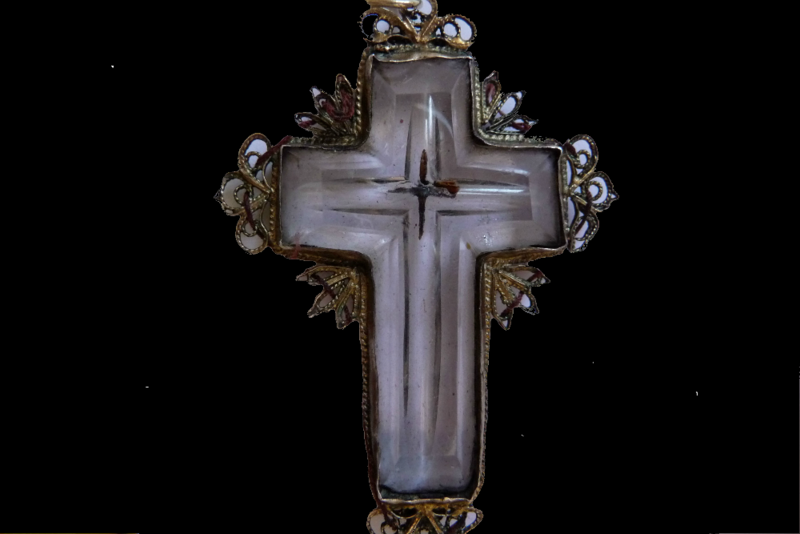 for the Holy Cross of Our Lord Jesus Christ in each and every person. flickers so faintly in the hearts of men. Mark 9:38. 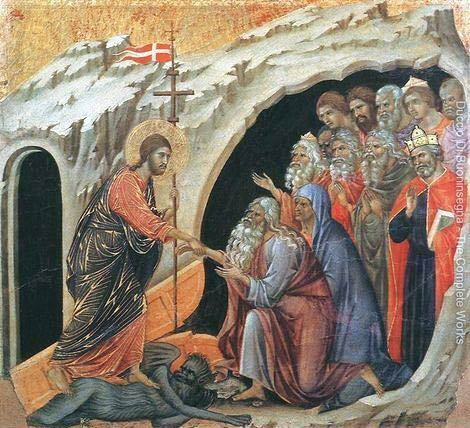 John said to Jesus, "Teacher, we saw someone casting out demons in Your name, and we tried to hinder him because he was not following us" :39 But Jesus said, "Do not hinder him, for there is no one who shall perform a miracle in My name, and be able soon afterward to speak evil of Me" :40 for he who is not against us is for us! Here we see that the apostle John was talking to Jesus about a man that they met and who was casting out demons in Jesus’ name. The disciples tried to stop him because he was not one of the twelve. But for Jesus, that was not a good reason. He told them that they shouldn’t have prevented him from casting out demons. in His mission was not as restrictive as that of the disciples. There is a lesson here for the church of Christ. We should not limit the grace of God to a specific congregation or a specific denomination. 'in truth, in Spirit and in the name of Jesus' - hallelujah! by whomsoever it may be (of the Christian Family of Jesus Christ), whether by a Presbyterian, a Catholic or a Baptist! Praise Lord Jesus; all you holy servants of the LORD. Amen. Great is the LORD... all Power and Might are His! For everyone who calls on the name of the Lord will be saved. Amen. 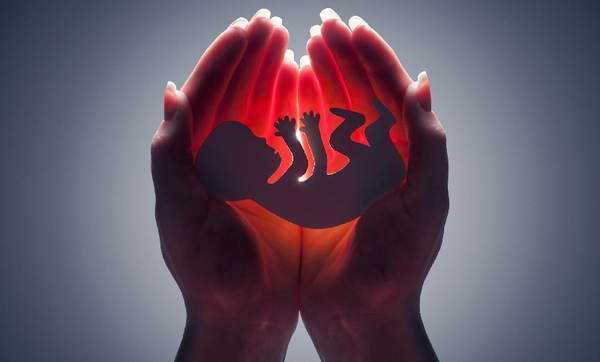 a gift of life, from God. which Thou hast given to our offspring. 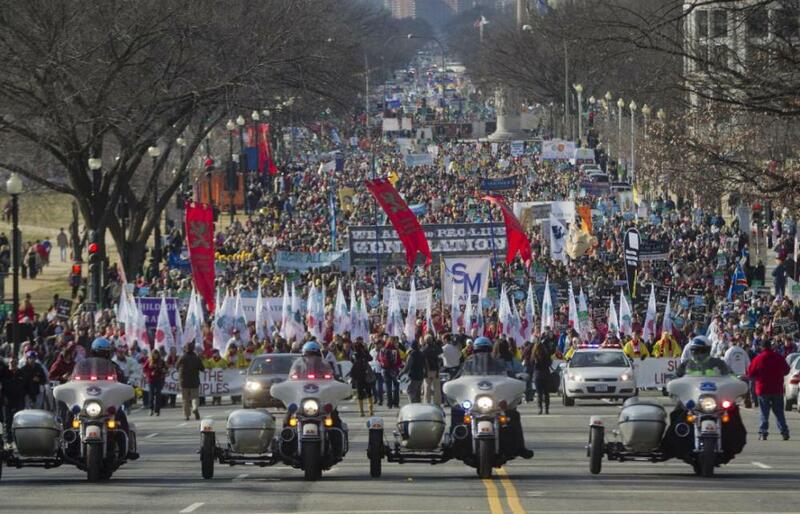 by aborting our unborn babies. shall have its reward", says the LORD. There is hope for your future. …in God. 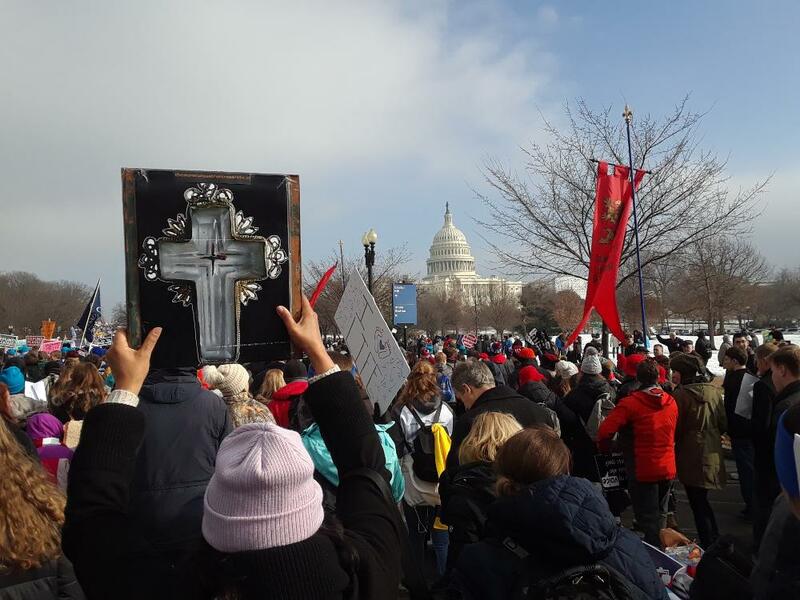 the Relic of the True Cross present in - the March for Life 2015 - Washington, D.C.
the Relic of the True Cross present in - the March for Life 2018 - Washington, D.C. 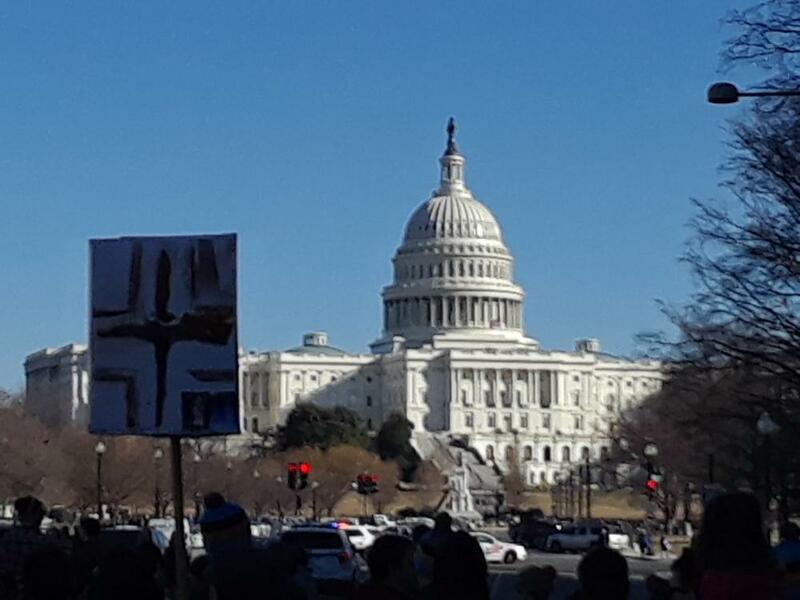 The Relic and the Image of the True Cross present at the 2019 March for Life - Washington DC. 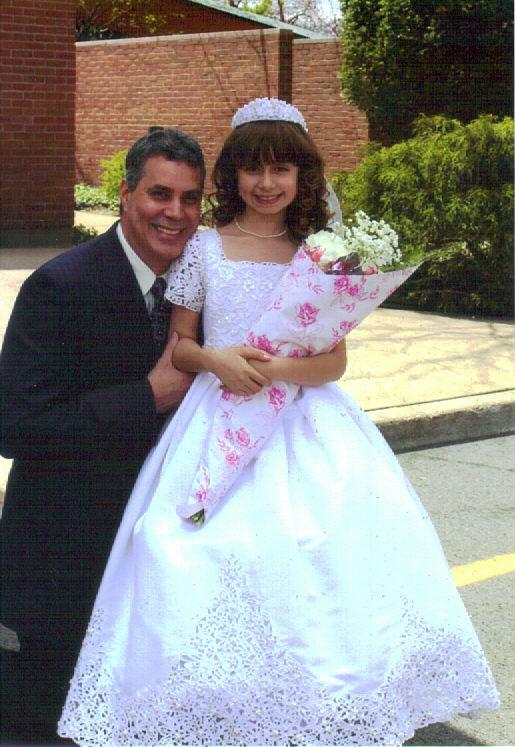 Please pray that "Someday we'll be together"
my daughter 'Mariaelena' + daddy. be filled with the Peace of Jesus Christ. "I am praying by myself "
"My soul is sorrowful, even unto death"
Remember all the fear, anguish and pain that Thou didst suffer in Thy delicate body before the torment of Thy crucifixion, when, after having prayed three separate times, bathed in a sweat of blood, Thou wast betrayed by Judas, Thy disciple, arrested by the people of a nation, that Thou hadst chosen and elevated, accused by false witnesses, unjustly judged by three judges, during the flower of Thy youth and during the solemn Paschal season. Remember, loving Jesus, that Thou wast despoiled of Thy garments and clothed in those of derision; that Thy face and eyes were veiled, that Thou was buffeted, crowned with thorns, a reed placed in Thy hands, that Thou was crushed with blows and overwhelmed with affronts and outrages. In memory of all these pain and sufferings which Thou didst endure (by our sins) before Thy passion on the life giving cross, grant me (if it be Your will) before my death, a true contrition, a sincere and entire confession made worthy satisfaction and the remission of all my awful sins. Thy precious blood... to the perfection of eternal salvation. O' Jesus, creator of heaven and earth whom nothing can encompass or limit, Thou who dost enfold and holds all under Thy loving power, remember the very bitter pain Thou didst suffer when the Romans (and us sinners) nailed Thy sacred hands and feet to the cross, by blow after blow with big blunt nails, and not finding Thee in a pitiable enough state to satisfy their (our) rage, we enlarged Thy wounds (through our sins) and added pain to pain, and with indescribable cruelty we stretched Thy body on the cross, pulled Thee from all sides, thus dislocating Thy limbs. I beg of Thee, O' my loving Jesus, by the memory of this most holy and most loving suffering of the cross, to grant me the grace to fear Thee and to love Thee forever! "Father forgive them, for they know not what they do"
through this great mercy, and in memory of this loving suffering. Grant that the remembrance of Thy most bitter passion may effect in us a perfect contrition and the remission of all our miserable sins. "Son(s), behold thy Mother [Mary]"
I beg of Thee O' my Savior, by the sword of sorrow which pierced the soul of Thy holy mother; Mary, to have compassion on me in all my afflictions and tribulations, both corporal and spiritual, and to assist me in all my trials, and especially at the hour of my death. and to extinguish in us the concupiscence of the flesh and the ardor of worldly desires. at the hour of our death, that they may serve as a remedy of consolation for our souls. why hast Thou forsaken Me?" terrors and pains of my death. whose way is wide and easy for those who love Thee. O' Sweetest Jesus, in heaven. my soul will be in anguish. "Father, into Thy hands I commend My Spirit"
and with Thy Body all torn, and Thy Heart Broken, and the bowels of Thy Mercy open to redeem us, Thou expired, Jesus, but the source of life gushed forth for souls, and the ocean of mercy opened up for the whole world. O Fount of Life, unfathomable Divine Mercy, envelop the whole world and empty Yourself out upon us, and by this precious death, I beg of Thee O King of Saints, comfort me and help me to resist the devil, the flesh and the world, so that being dead to the world I may live for Thee alone. I beg of Thee at the hour of my death to receive me, a pilgrim and an exile returning to Thee. O' Jesus, true and fruitful vine. Remember the abundant outpouring of precious blood which Thou didst so generously shed from Thy sacred body, pressed down and running over as the grapes in a wine press. From Thy side, pierced with a lance by a soldier, O Blood and Water, which gushed forth from the Heart of Jesus as a fountain of Mercy for us, I trust in You! That issued forth until there was not left in Thy Body a single drop, and finally, like a bundle of myrrh lifted to the top of the Cross Thy delicate Flesh was destroyed, the very Substance of Thy Body withered, and the marrow of Thy bones dried up. Through this bitter Passion and through the outpouring of Thy Precious Blood, I beg of Thee,O' Sweet Jesus, to receive my soul when I am in my death agony. O' Sweet Jesus, Pierce my heart so that my tears of penitence and love will be my bread day and night; may I be converted entirely to Thee, may my heart be Thy perpetual resting place, may my conversation be pleasing to Thee, and may the end of my life be so praiseworthy that I may merit Heaven and there with Thy saints, praise Thee forever. King Herod and Pontius Pilate. the agonizing pain, the gross indignities, the outrageous mockery, the heartless cruelty. Please in Your Divine mercy now give those I have injured some radiant special blessing of grace and happiness today, be they now in this world or the next. the weakest and most vulnerable of your children and servants here on earth. revealed and judged. punishments will certainly follow! as You forgive all those who have committed and will commit crimes against You, but who are sincerely penitent, for we truly do not realize fully what we do. Crucified Jesus, Risen Lord, Triumphant God Eternal. the sins of the whole world. the salvation of the dying. I Salute You, I adore You, and I love You, oh adorable Face of my Beloved Jesus, as the noble stamp of the Divinity! Completely surrendering my soul to You, I most humbly beg You to stamp this seal upon us all, so that the Image of God may once more be reproduced by its imprint in our souls. Amen. O' Eternal Father, since it has pleased our Divine Savior to reveal to mankind in our present century the power residing in His Holy Face, we now avail ourselves of this treasure in our great needs. Since our Savior Himself promised that by offering to You, O' Eternal Father, the Holy Face disfigured in the Passion, we can procure the settlement of all our affairs, and that nothing whatsoever will be refused us, we now come before Your Throne. Offering to You, O' God, this adorable Countenance, disfigured with painful bruises and covered with shame and confusion, we beg through the merits of this Holy Face to obtain these, our pressing needs. Grant us pardon, Eternal Father, for the worst crimes of our age, which are atheism, blasphemy, and the desecration of Your holy days. May this offering of the Holy Face of our Savior before Your throne obtain for us deliverance from these evils. Send us, O' God, many vocations to the priesthood and to the religious life, so that by their prayers, their works, and their sacrifices, they may spread the blessings of Your Church and confound Your enemies. Amen. Eternal Father, we offer You the Adorable Face of Your well-beloved Son, for the Honor and Glory of Your Holy Name, and for the salvation of our country (mention your country's name). Amen. O' Almighty and eternal God, look upon the Face of Your Son Jesus. We present it to You with confidence to implore Your pardon. The All-Merciful Advocate opens His mouth to plead our cause; hear His cries, behold His tears, O' God, and through His infinite merits hearken to Him when He intercedes for us poor and miserable sinners. O' good Jesus, Who has said: “Ask and you shall receive "
" Seek and you shall find "
Be merciful to us, O' God, and reject not our prayers when, amid our afflictions, we call upon Your holy Name and seek with love and confidence Your adorable Face. Amen. and under the earth, by all the creatures of God, and by the Sacred Heart of Our Lord Jesus Christ in the most Holy Sacrament of the Altar. Amen. Show us Thy Face, O' LORD; and we shall be Saved!